We love the destruction video channels: hydraulic presses, waterjets, and slingshots. 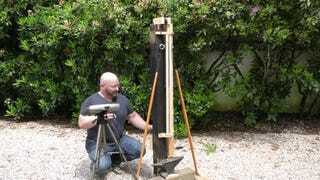 Now, Joerg Sprave, the guy behind the Slingshot Channels has come up with his own version of a press. The Hydraulic Press channel sent him some gifts, which prompted Sprave to go and create his own ‘The Rubberaulic Press’, powered with a 7.5 kilogram steel slugs and rubber straps. It doesn’t quite flatten things like the hydraulic press does, but you certainly don’t want to get your hand under that. It’s a shame that the pair aren’t on camera together. That would be like the world’s most destructive team up movie.